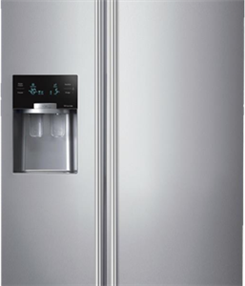 As an authorised partner, we offer a wide range of Samsung refrigerator parts, such as new water filters, supply lines and rubber door seals. We supply 100% original refrigerator parts and deliver directly from the Netherlands. You can order parts by entering the model code in the field above. 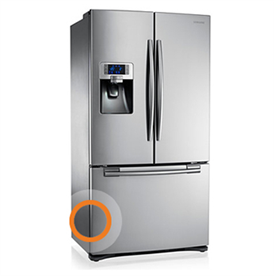 To order parts for your refrigerator on Samsungparts.eu, you always need the model code of your appliance. This code is always included on a sticker on the outside of the refrigerator or in the fridge compartment of a built-in refrigerator. Take note! Do not confuse the model number with the model code. The model code is a combination of letters and numbers. Enter the model code in the grey bar and you will be taken to the model page. This page contains all available parts and allows you to choose the part you want. Need help? Our Support desk would be happy to oblige. Water filter: hit is advisable to replace the water filter on your refrigerator every six months. The water filter ensures that the water/ice is safe to consume. If you do not replace the filter, there is a chance that more bacteria will be present in the water. Water line: it is advisable to replace the water supply line regularly because cracks in the line can occur over time. By replacing the water line regularly, you can avoid leakages and breakdowns. You can find original water supply lines on the model page. Enter your refrigerator's model code above. Vegetable compartment: the vegetable compartment is a popular item in our Samsung range because people often drop them or bump something into them, causing them to break. Each refrigerator has its own type of vegetable compartment. To find the correct type of vegetable compartment for your refrigerator, enter the model code in the grey bar above. Rubber door seals:does your refrigerator door no longer close properly or is the seal dirty? You can order new rubber door seals from us. If you would like to know how to replace the rubber seals on your fridge, read the article 'How do I replace a rubber door seal?' on the official Samsung website. Our Support desk would be happy to help you find the correct model code or the appropriate part number for the refrigerator parts you need. Contact them at any time for advice or assistance.